The dazzling Calvin Contemporary Buffet White will add swanky pizzazz to your modern living room.The white finish and luminous layout add a detailed The dazzling Calvin Contemporary Buffet White will add swanky pizzazz to your modern living room. The white finish and luminous layout add a detailed and radiant appearance. Use this piece to store your extra china and other items out of sight until needed. To complete the overall look, highlight this piece with some modern accents such as our ceramic Nem Bowl. 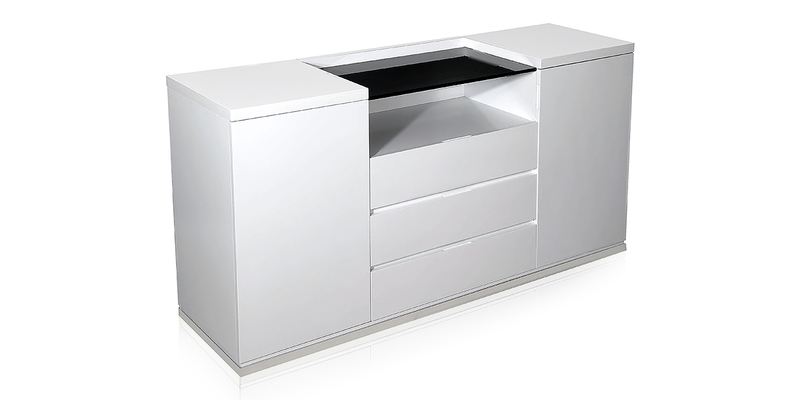 The dazzling Calvin Contemporary Buffet White will add swanky pizzazz to your modern living The dazzling Calvin Contemporary Buffet White will add swanky pizzazz to your modern living room. L: 63" * W: 16 1/2" * H:32"